In a world where you can watch 800 channels of television shows not only on your flat screen TV but on your laptop, iPad, or iPhone, choose between a soccer match in South Africa or football in Florida, it’s hard to imagine a time when getting a sports program from Jacksonville, Florida to your TV set in Wilmington North Carolina was newsworthy. 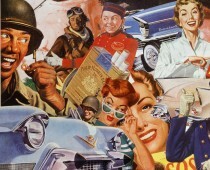 But as this 1951 advertisement from General Electric shows, it was nothing short of a miracle. A Football Fans Fantasy! GE television overpowers interference and distance! The president of Tidewater Power Company pictured in the ad above was seemingly out of luck if he wanted to catch a regional football game from Charlotte or Jacksonville in the comfort of his Wilmington wood-paneled den. After all, Wilmington, North Carolina was 350 miles from Jacksonville, 210 from Norfolk and 180 miles from Charlotte. One look at the map and you’d think Mr. Bell would be out of the TV picture. That is until he got a GE Black-Daylite Television. Now we learn, our well-heeled, corporate fat cat gets all 3 stations with ease on his GE set. 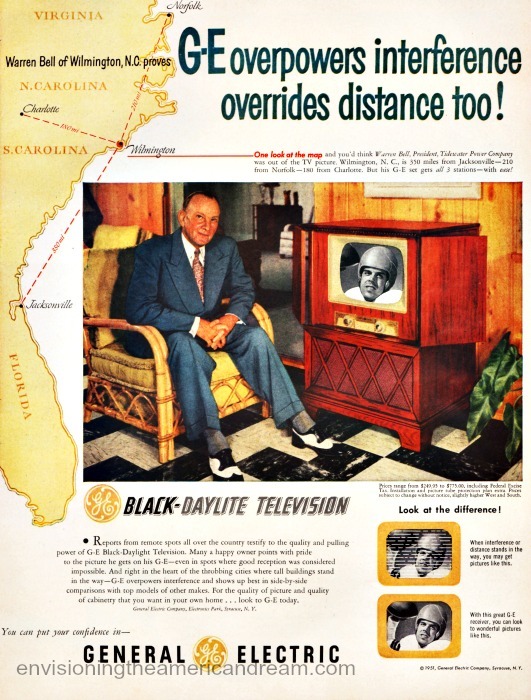 “Reports from remote spots all over the country testify to the quality and pulling power of G-E Black-Daylite television,” the ad informs us. Postscript . By the end of the year on December 23, 1951 Du Mont televised the first ever live coast to coast professional football game the NFL Championship game between the LA Rams and Cleveland Browns thanks to the transcontinental cable lines that had been set up earlier that fall. © Sally Edelstein and Envisioning The American Dream, 2019. Along the lines of America’s utter obsession and fanaticism for the 3 major sports, especially football, now that there are 800+ viewing channels, WiFi streaming just about anywhere on the planet, and of course the electrical power or battery power to watch and listen to the U.S.’s greatest game, if you can’t be at the stadium… WHAT are Americans actually watching or listening to on their TVs or devices? My husband has for years always recorded football games watching them later so he speeds through all the superfluous time. The whole game takes up about 45 minutes vs wasting an entire afternoon. I chose not to watch it. A sixty minute game shouldn’t last over three hours! I have better things to do with my time. I admittedly have never watched a football game on television let alone the SuperBowl except occasionally he half time extravaganza, but haven’t done that in years. It holds zero interest.